The Romans gave the name of “Lacobriga” to the town but its natural river port would indicate very much earlier occupation. The Moors then gave the town the name of "Zawaia" It was captured from the Moors in 1189 but it was not until 1249 that it was finally conquered by Dom Afonso III and integrated into the kingdom of Portugal with the name of "Lagus". This historic town has played an important part in the story of discovery of many parts of the world. 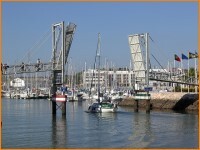 It was from the harbour that Vasco da Gama sailed in 1499 on his historic and epic voyage of discovery. 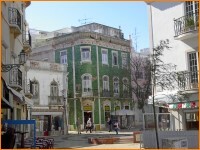 Lagos was the capital of the Algarve from 1578 until 1756 and there remain several ancient buildings to testify to its historic glory. From its Port maritime expeditions were embarked upon to discover the world at the orders of Prince Henry the Navigator. Also, the Armada of 800 vessels led by the ill-fated heir to the throne Dom Sebastião embarked from Lagos in 1578 to capture the town of Ceuta in Morocco. It is written that the very first time the famous explorer Columbus from Genoa set foot in the Iberian Peninsular, was when the inhabitants of Lagos saved him and other sailors from the shipwreck of a vessel in which he was sailing. Another interesting fact is that Francis Drake in 1587 failed in his attempt to raid Lagos and then sailed on to Sagres to sack the occasional historic home of Henry the Navigator". Essentially now an important tourist town there are still many architectural signs of its ancient past, even a building dating originally back to around 1445 which is recorded as being Europe’s first building used as a slave market. The walls of the town in the most part remain after sections were restored. Attached to the famous 17th Century "gold" church of Santo António there is a small museum of regional items, some of which are quite odd! There are several interesting statues erected to the famous figures of the past that are associated with the history of this town. None more controversial that the sculpture of Dom Sebastião standing in the main square in front of the Town Hall. 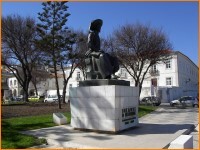 A more recent statue commemorates the Algarve’s only Saint, São Gonçalo de Lagos, who was born in 1360 and died in 1422 in Torres Vedras. Pope Pio VI raised him to Sainthood in 1778. The town’s more recently constructed Marina presents a lovely picture and this harbour is practically the first sight a visitor has of Lagos. Besides the boats that find it convenient as a permanent mooring it is usually full of yachts passing on the way or returning from the Mediterranean and the Americas. 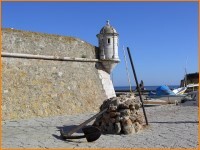 At the entrance to the harbour is the "Forte da Bandeira" which was constructed in the 17th Century. 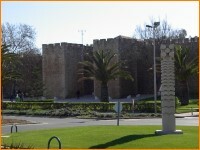 The municipal council has constructed near to the centre of the town there is a reasonably modern Cultural Centre in which various exhibitions and culturally related events are held during the year. In the Marina visitors will find different boat tours, yacht hire, and deep sea-fishing outings that can be booked. To the east and across the river from Lagos is Meia Praia, a very long sandy beach sheltered to the north by a gentle slope dotted with comfortable villas. To the west of Lagos the once upon a time fishing village of Praia da Luz is now devoted to the quieter side of the tourist trade and is the home of many residents from the colder northern climates. Further to the west is a another small fishermen's beach village of Burgau. Moving even further west is the coastal village of Salema. Here will be found some small Roman ruins proving the existence of its past importance. The furthest west town is Vila do Bispo and is a very small administrative town for the Sagres area, the later being the most south-west corner of Europe! This area is a must for every visitor to the Algarve as it presents a very impressive and dramatic sight of towering sheer cliffs being beaten by the weight of the vast Atlantic Ocean. It is from here that Prince Henry sat and planned the several epic voyages of discovery that enlarged the known world of that time. Cape Santo Vicente is the name given to this promontory as it was here that fable has it that the Saint supposedly landed and decided to reside here for a period. To the north of Lagos on the road to Lisbon is the small town country town of Aljezur with some fine nearby west coast beaches. Originally a hamlet, the Moors constructed a castle in the 10th Century whose ruin still stands today overlooking this town.